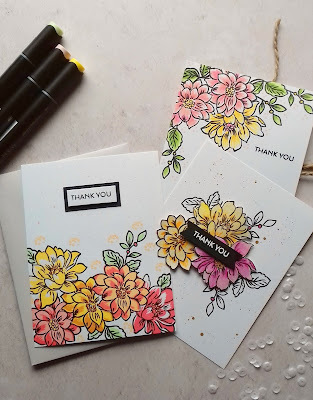 Happy Monday Crafters, Today I am launching a new series on my blog called "3 ways with"
Today I am sharing 3 cards created with the Sunlit flower card making kit from Altenew. 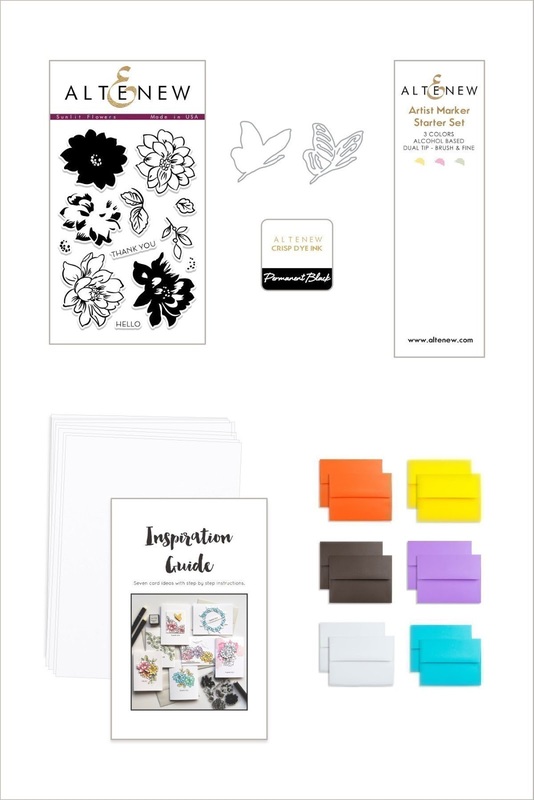 The kit is jam packed with a whole host of goodies to create stunning cards, If you've not got any Altenew items in your stash this kit is a perfect starting place. The kit has, a layering stamp set, a layered butterfly die, an ink pad, 3 Artist markers, cards, envelopes and an inspiration guide. 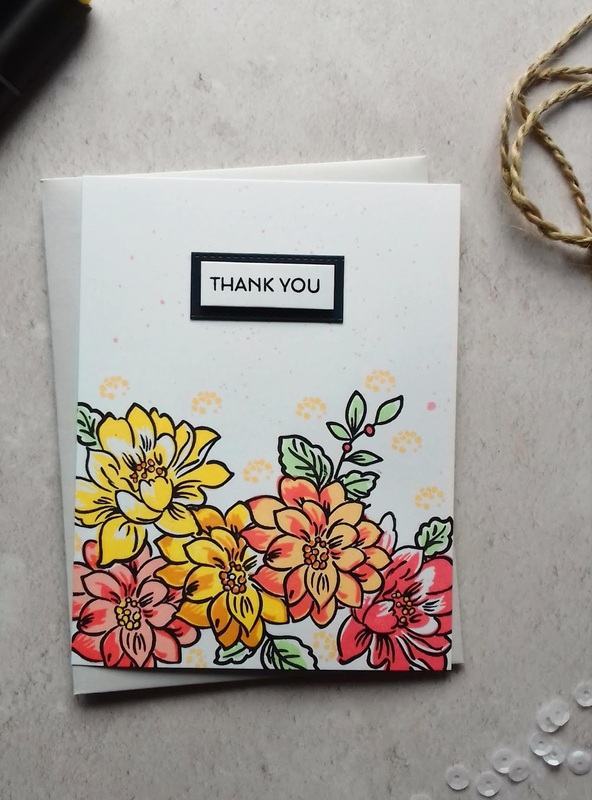 I have made 3 cards using 3 different techniques, Layered stamping, Simple watercolour and colouring with Artist markers. Of course I used some items from my stash and will link to them for you. I started by stamping all of the elements onto masking paper and fussy cut them in order to be able to create a floral composition. 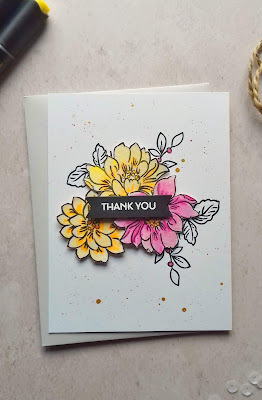 I stamped the flowers and leaves using the black ink included in the kit. I used several coloured inks from my stash to add the layered colours to the flowers, I choose Coral Bliss, Pink Pearl, Warm Sunshine, Sunkissed and Caramel Toffee crisp inks. I used the stamp which normally adds the centre to the flowers to decorate around the floral display. Next up is my simple watercolor, and when I say simple I really do mean simple. 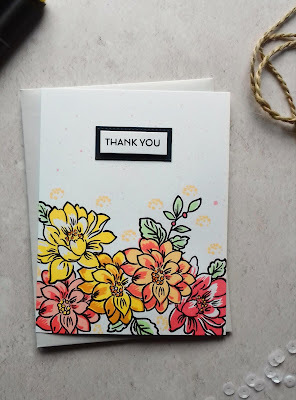 I literally just stamped out the flowers, heat set the ink and then added some watercolor using the 36 pan watercolor set. I fussy cut the flowers and added foam pads to give dimension. I used some of the leaf and spring stamps to add more shape to the design, I stamped these direct to one of the cards in the kit. I added a heat embossed sentiment and some inky splatters using Antique gold and Coral Berry spray inks to finish the card. For my last card I wanted to show how you can use Altenew Artist markers to give a cute look with no experience with using Alcohol markers. Once again I stamped out my floral display using the mask I made earlier. I opted for pink and yellow tones to colour my flowers. I used the inspiration guide to see where the darker areas on the flowers would be. 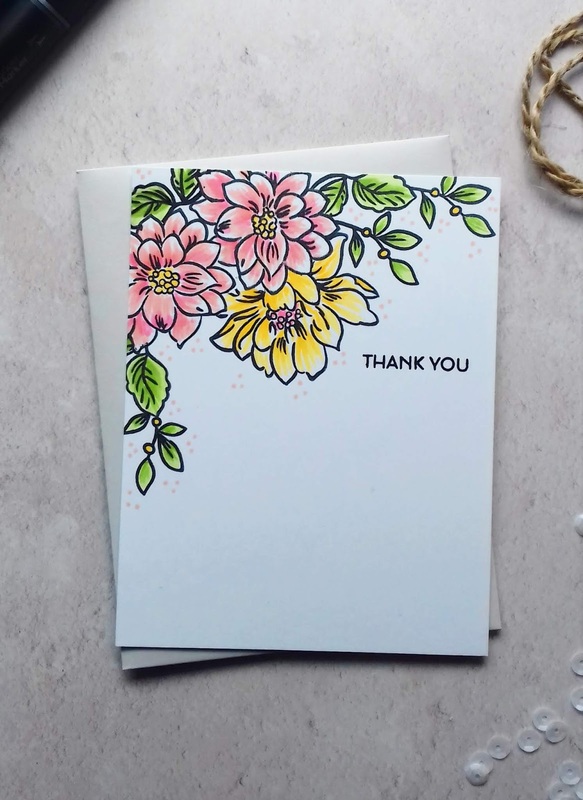 I used the darker shade of pink or yellow depending on which flower I was colouring and added little flicks of color from the base of the petal to about half way up, it's important to turn your card so that you are flicking away from you each time you color a new petal. I then use the lighter shade to flick in the same way this time going from the base of the petal to about 3/4 of the way up the petal. You can use 3 shades of a colour if you prefer a fuller petal. I hope you like the cards I've shared today, please pop back soon for more crafty eye candy. 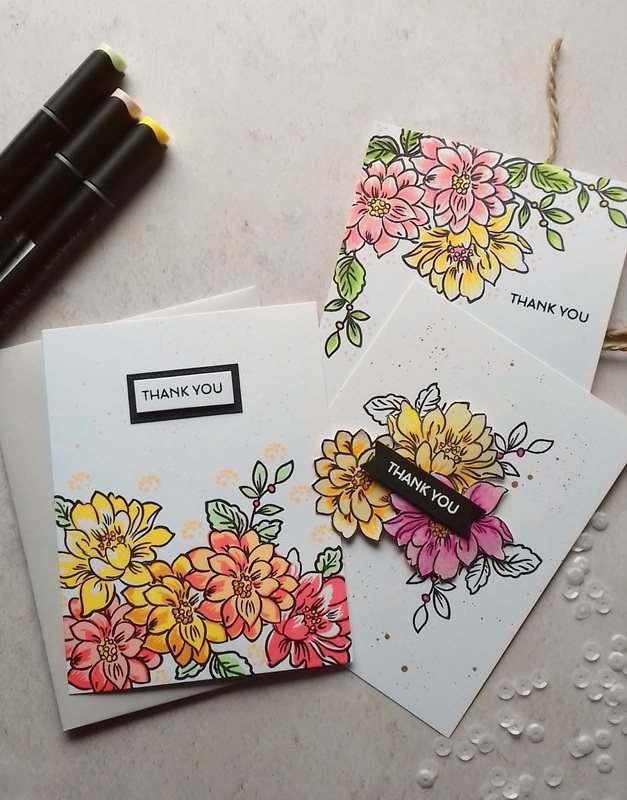 All three cards lookgreat with you, both for layout and the colouring. Beautiful coloring and layout, Terri! Altenew don't just do florals! Altenew Educators Blog Hop Winner Announcement.